BCC Kids is a caring community designed just for kids! All kids, birth through fifth grade, experience safe and fun environments where they can grow in relationship with friends, leaders, and God. The Bible is taught in creative and relevant ways so that your child can grasp and understand God’s Word. Our desire is to partner with you as parents to be another voice in your child’s life so your child will know, love, and live their life for Jesus Christ. Your family is invited to join us in BCC Kids during our 9:00am and 10:45am Worship Services. When you arrive, follow the BCC Kids signs downstairs to the check-in where we will check your child into their room. 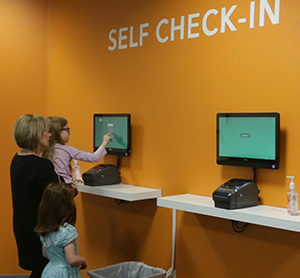 At check-in you and your child will be given matching security tags that will be used during check-out time, or should we need to contact you during the service. Classes meet at 9:00am and 10:45am. Infants and toddlers alike feel loved and cared for in our clean, well staffed nursery area. They learn that God loves them and that they are special. Babies in the infant nursery can play, rock, sleep, etc. Toddlers participate in age-appropriate activities, Bible stories, singing and prayer, and snack time. Early Childhood age children (3 years through Kindergarten) will experience age-appropriate Bible teaching and active learning, worship through singing and prayer, crafts and snack time. At 9:00am and 10:45am, our grade school children build a firm foundation as they are taught the Word of God through Bible study and appropriate applications for their daily living. We give them opportunities to accept Jesus as their personal Savior and teach them early to depend upon the Holy Spirit to give direction to their lives. Can I bring my child if he/she isn’t feeling well? Our desire is to offer safe, healthy and quality ministry to children. Children with the following symptoms cannot be left in our care. Children must be symptom free from cold or flu for a minimum of 24 hours. Elevated fever during the past 48 hours (99.6 or above and without the use of fever reducing medication) and experiencing symptoms of diarrhea and/or vomiting. Exhibiting signs of a contagious health condition such as lice, croup or chicken pox. Orange is a strategy that combines two influences to fuel faith in the next generation. It’s what happens when you combine the light of the church (yellow) and the heart of the family (red) to lead a generation toward God. Classrooms open 15 minutes prior to the start of the service. After your child has been checked in at a computer, they can head to their classroom where they will be signed in by a leader in the room. To ensure a continued safe environment, we ask parents/guardians to pick up their children immediately following the service unless paged beforehand. 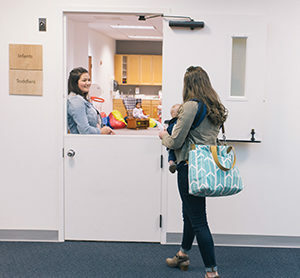 If there is anyone who is not allowed to pick up your child or you have custodial information of which we should be aware, please be sure to notify a check-in attendant who will direct you to a BCC Kids staff member. How do you determine classroom placement? 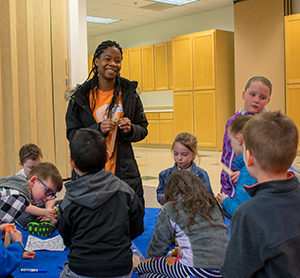 Infants through 5th graders at BCC Kids have been placed in a classroom based on their birth date as it applies to Oregon’s state standard for school placement. All children in each classroom must be the age or grade of that specific class before September 1st of the year they are entering school. At BCC Kids, all children move up to their new classrooms together, one time each year. This means when your child has their birthday they will remain in the same classroom in which they currently attend. We structure our classrooms this way because we highly value the relationships your child is forming with leaders and friends in their classroom. Similar to your child’s weekly school or preschool routine, your child will remain in the same classroom for the entire school year and then graduate to the next classroom on our Move Up Sunday in the summer. If your child has special needs, please contact the church office to speak to a member of the BCC Kids staff prior to attending on a Sunday morning so we can discuss your child’s needs.